To an outsider, the residence of 3 Fea Street looks like any other Dunedin flat. Peek over the fence and you might notice a large, well-cleared backyard and faded posters decorating the outside of the house. 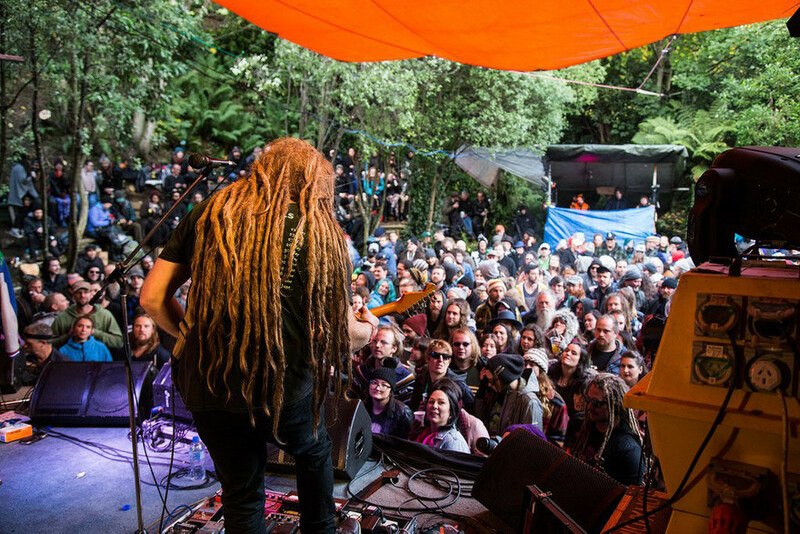 But once a year, lighting and sound systems are brought in, fences are erected and the flat plays host to dozens of New Zealand musicians and a crowd of hundreds. 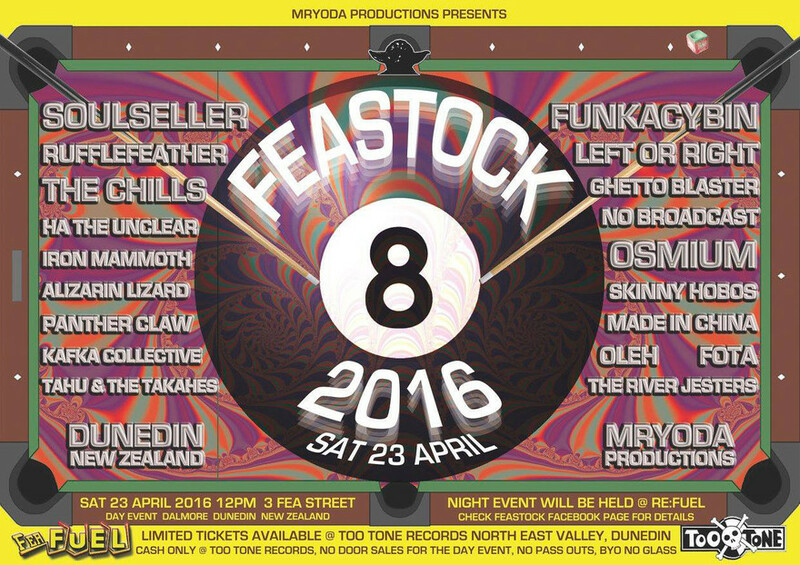 This is Feastock, the country’s most idiosyncratic indie music festival. 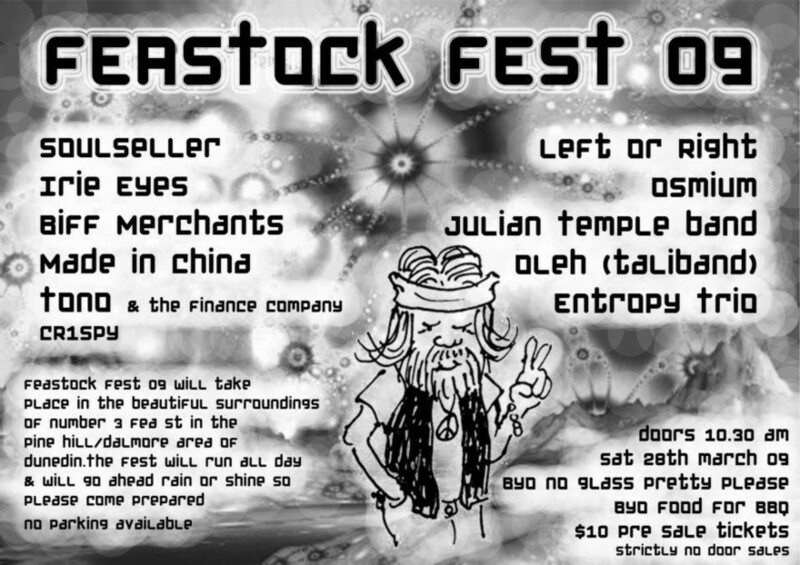 The inaugural Feastock - Feastock 2009 poster. Feastock began in 2009 thanks to the ingenuity of the resident flatmates. Among them were Steve Marshall and Callum Hampton – who had played in Left or Right – and Logan Hampton from Alizarin Lizard. All were well established in the southern music scene. 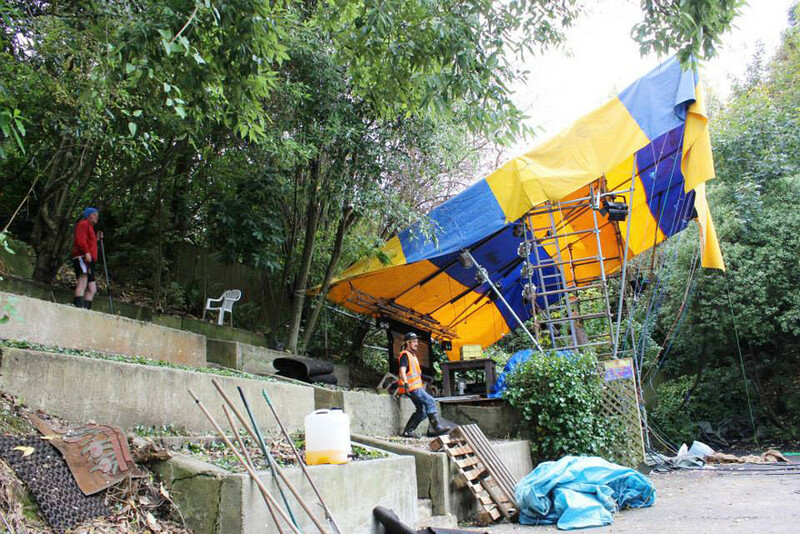 In the 2010 film Feastockumentary, they explain how they were inspired by their surroundings to turn their backyard into a venue for the festival. “We were playing backyard cricket out here one day in this glorious oval,” an unidentified voice says. “And we’ve got this stage that’s hard to not notice – this retaining wall here we’re sitting on. I think Logan said, ‘Look at this stage right here!’ But back then it was all overgrown, it was bushy, we had to chop it all back.” It took a fair amount of landscaping until the backyard was suitable. “The hill came pretty much to the front, it had heaps of trees on it, we had to cut them all down”. Over the next decade Feastock grew from strength to strength and established itself as an institution in the local music scene. The event hosts over 300 people each year, and tickets consistently sell out. The crowd is from all walks of life: students, musicians, old rock fans and people from all over the country. 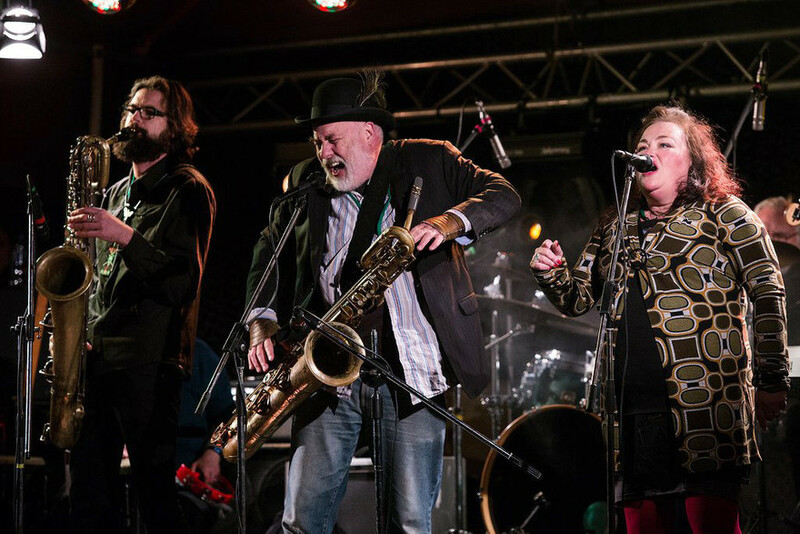 The festival has featured bands and artists from all around New Zealand but there has always been a strong focus on Dunedin and Southland bands. Regular offenders include the resident Left or Right, plus No Broadcast, Oleh, Julian Temple Band, Made in China, and Males. Following the success of the first Feastock, the residents decided to document the process in 2010 in the 50-minute Feastockumentary. The video opens with shots of the behind-the-scenes work required to put on the festival. The personality of the flatmates is captured very early on, with them debating whether the correct greeting should be “Happy Feastock” or “Merry Feastock”. Feastockumentary also featured interviews with the organisers explaining the conception and ethos of the festival, as well as live footage of every band that performed throughout the day. Tickets to Feastock 2011 came with a limited edition “Deluxe Feastockumentary DVD”. Part of the institution that is Feastock is Tony Renouf from Too Tone Records who, until 2017, was the ticket vendor for the festival. His blog Bored in a Record Shop features many years of Feastock reviews and photos that capture the atmosphere. 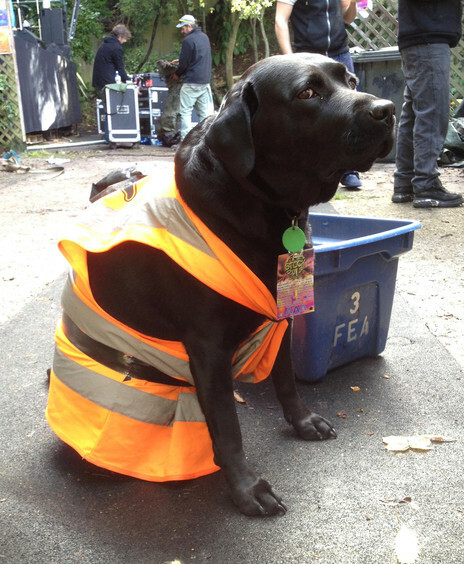 Another important attendee is Roxy, who can be seen in her high-vis vest every year and does extremely well out of scraps from the barbeque. Feastock’s ongoing success can be attributed to the level of organisation and planning that goes into it every year. Dozens of portaloos are brought in and the perimeter is fenced off to ensure no one sneaks in. While it is BYO, there is a strict no-glass policy. A barbeque runs all day with free sausages and patties until they run out (I confess to cooking my own steak in 2016 and eating it with my bare hands). 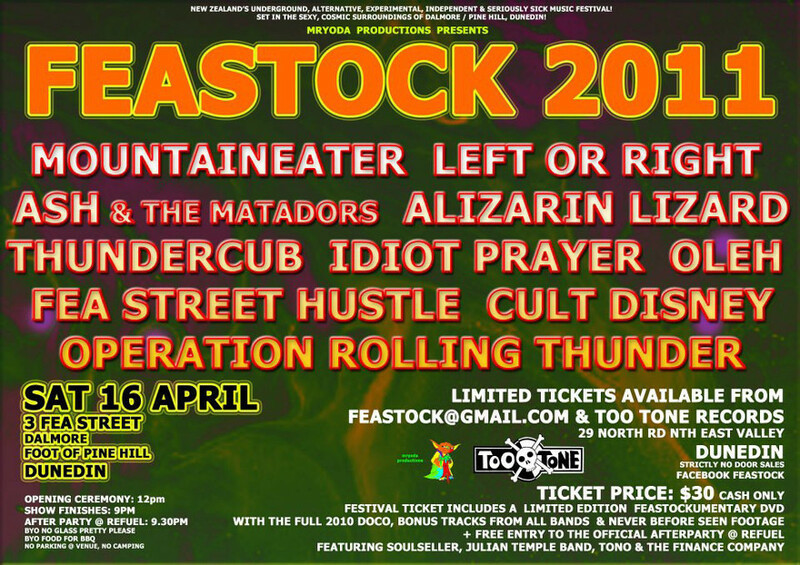 For a few years after the 2009 debut, Feastock ran from midday until 9pm; more recently it has finished earlier, with buses then ferrying everyone to a bar in town where the second half of the acts perform. A lot of effort goes into keeping the neighbours happy, as organiser Marshall explains in Feastockumentary: “These guys always do a letter-drop to the neighbourhood, but we’ve had big talks about actually making sure we see people face-to-face so everyone actually does know.” The letter emphasises that Feastock is an organised and controlled event, and details what time it finishes. It also welcomes them to attend the event for free if they want. Despite this, they have still had noise complaints, and in Feastockumentary they joke that they should slip the noise control staff some free tickets in future. They also received a written note from one of their neighbours who couldn’t attend but listened from their porch and thanked them for putting on the show. Dunedin student parties cop some bad press, most prominently in 2016 when a balcony collapse at the Six60 flat on Castle St left one student with serious spinal injuries. Pressure from the university and police means underground gigs at flats are now often shut down. 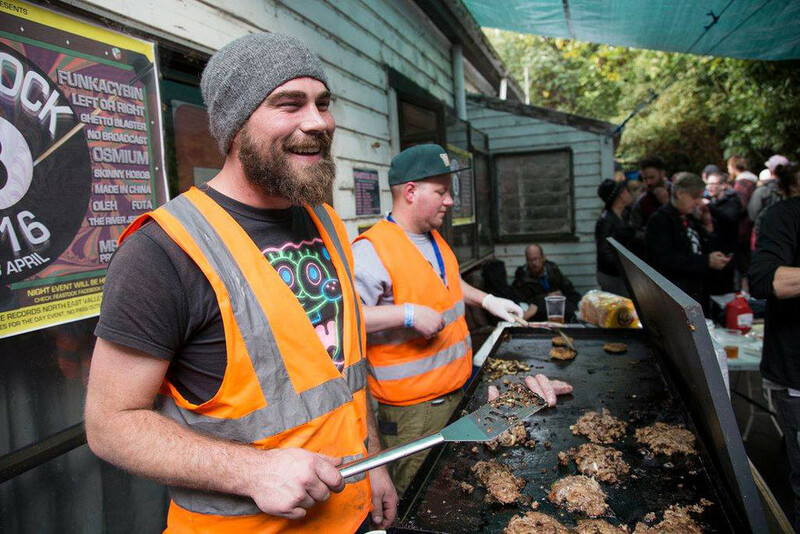 Aside from being better organised than those pop-up gigs, being located on Pine Hill means Feastock is geographically distant from Dunedin’s student centre. But while Feastock captures the spirit and ingenuity of Dunedin, it also represents something much bigger for the greater southern music scene. 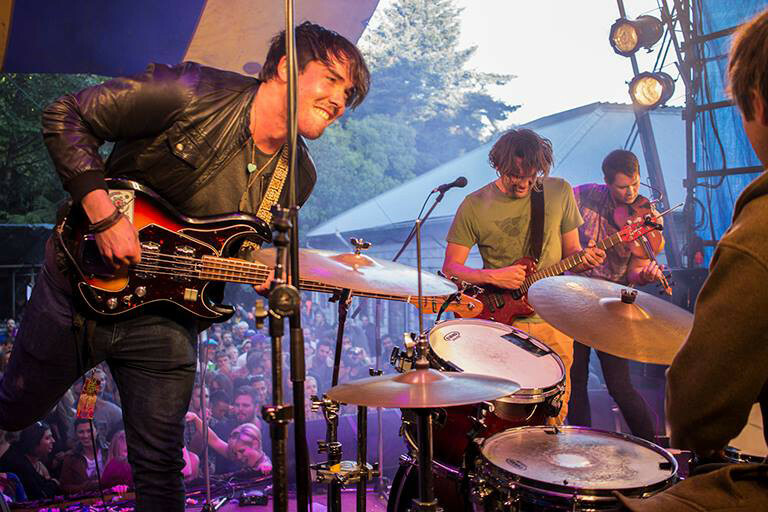 Many of the bands and organisers hail from Invercargill and nearby towns, and many more make the journey every year to come and see them. For the 2009 Feastock press release, Callum Hampton described the festival as “a celebration of current Southern bands and artists,” and this has remained part of its ethos ever since. 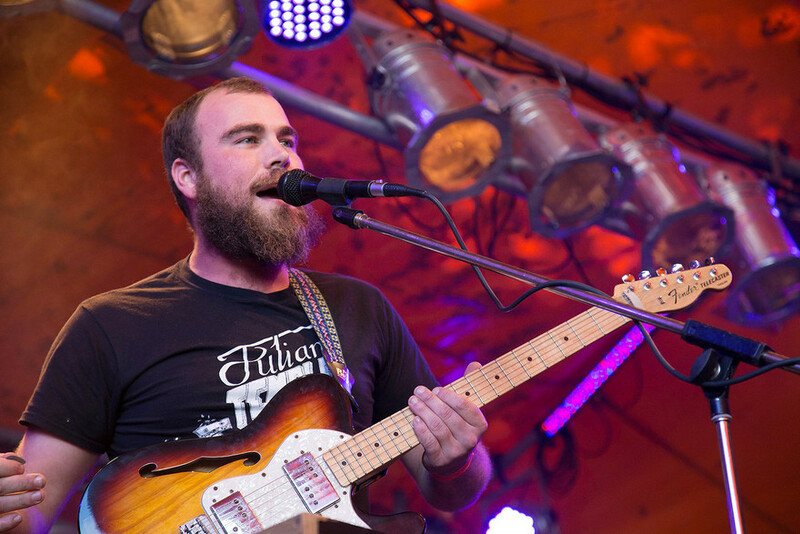 Feastock set out in 2009 to celebrate and represent the Dunedin and southern music scene, and has certainly done that. Without selling out or losing sight of the event’s origins – which really was just to have a bunch of mates jamming in their backyard – the conspirators at 3 Fea Street have created an iconic local institution.